Conservatives Only Hinder People From Being Christians! Lets take a look at some of what Jesus said about bad people who call themselves Jews or Christians to present themselves as part of a moral movement, moral fellowship, when in truth they are opposed to the teaching of Jesus scriptures from the gospels which identify Jesus as not only liberal but anti-conservative Luke 6:20-31, 12:48, 16:19-25 Matt 5, 6:19, 25:37-44, just to state a few examples. Jesus said to right-wing conservative religious leaders who later had Rome crucify Jesus, Jesus said “Ye have not come close to God and you hinder those who were on their way!” This is the way with all right-wing, all conservative preachers, teachers, they have not come close to Jesus and they hinder point others away from Jesus! These right-wing phonies created a false movement, a movement opposed to the teachings of Jesus, as Jesus said “thus in vain do the masses worship God teaching not the doctrines of God but their own man-made doctrines,” as Jesus told the masses about right-wing conservative religious leaders “those who lead you lead you astray,” “they honor God with their lips while their hearts are far from God,” these right-wing religious leaders like those who had Jesus crucified “love the chief seats of honor and love to be called rabbi ( teacher etc ), they are not for the people they claim they are for but they are opportunists who have out of their vile personalities sold out those who would truly follow Jesus is they were taught right as Jesus always a liberal is found in the gospels, these conservative fake Christian leaders have taken a small part of that which Jesus said in the gospels, a part that neither points to conservatives or liberals, they have screened-out anything said by Jesus that shows Jesus is a major liberal who rejects conservative self concerned people and as you read in Luke 16:19-25, Matt 25:37-44 Jesus condemns these conservative types. It is a vile act that right-wing leaders. 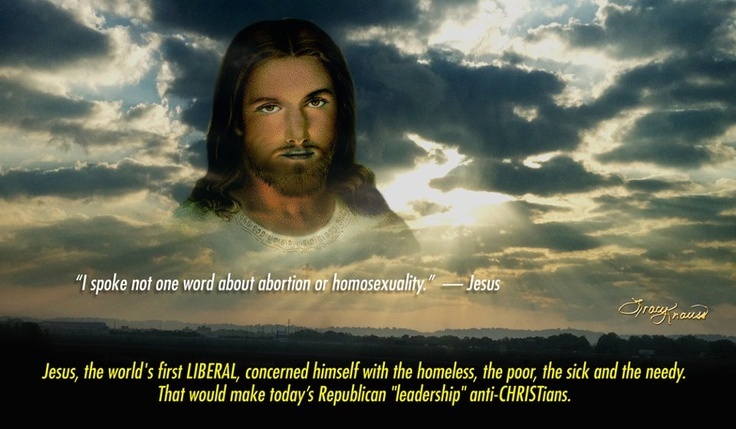 right-wing religious leaders claim to be Christian which is meant to lead people not to Jesus as He is in the gospels but to lead people against Jesus, to blind them to the truth, to blind them from the truth for their own financial gain, for political power used by the Republican GOP against the people to take from people what is theirs and to give it to spoiled right-wing opportunists who want to pay as little as they can get away with, charge as much as they can while delivering nothing good and calling good evil and evil good they have worked to convince people that those who are truly parasites and thieves such as all wealthy right-wing conservatives who are underpaying thanks to the GOP, over charging thanks to the GOP, lying like the devil, having convinced many that those who have been cheated are welfare cases who take from their betters when it is the vile wealthy corrupt conservative right-wingers who are the true parasites and worse thieves! See http://wp.me/p4mCzX-3f for further details! VERILY VERILY I CAN SHOW ALL TRUTH SEEKERS, I CAN SHOW THEM THE EVIDENCE IN THE BIBLE THAT PROVES NO CONSERVATIVE EVER WAS OR CAN BE A CHRISTIAN! Right-wing Conservatives don’t want you to really read all in the gospels JESUS spoke, they only can use about 20 – 25% of the teachings and orders of Jesus while they reject the bulk of what Jesus said! I unlike lying conservatives, tell people to open a Bible and read for themselves, I give them some of the many many scriptures coming from the LORD GOD JESUS that prove to all honest people that JESUS in anti-conservative and far left Liberal! Conservatives have no evidence to support their BS claims, I have abundant evidence: LUKE 6:20-31; 10:25-37; 12:48; 14:12-24; 16:19-25 MATT 6:19-24; 22:9; 25:37-44 < These are only a few of the many words or JESUS that prove no conservative is a Christian, no, not one, and they prove the LORD GOD JESUS is far Left LIBERAL! THEY CAN SAY WITH THEIR MOUTH / LIPS THEY ARE CHRISTIAN BUT AS JESUS SAID & TAUGHT : “These people honor Me with their lips but their hearts are far from Me!” “Thus in Vain do the masses worship God teaching not the doctrines of God but their own man-made doctrines!” JESUS spoke, JESUS gave more then one lesson using a man had two sons…. One of these tells of a father who tells one of his sons to do something this son says yes but once going out from his father due to his nature he does not do what hewas told to do. The father tells the other son do the same thing he told the first, this son said No to his father and left & went out, and once he was out in the world he ( out of the nature of his personality ) he did as his father instructed. Jesus asked which one did his fathers will… it was not the one who said yes I will do it father but once leaving didn’t it is the other! JESUS said of right-wing conservative kind that claim with their lips to belong to God Jesus said “you honor God with your lips but you do not do his will! If you are seeking truth go to my blog(s) at the well known 100% safe site ‘WordPress’ and look up MichaelTheOneL and start be reading ‘Conservatives Teach “Another Jesus” ( Not Found In The Gospels ). In truth the scriptures I listed here are enough for any and all people who can understand what they read, and the only other thing is you must be HONEST! If you lie to yourself, if you let the lies from right-wingers to influence what you read then you are not following JESUS and you are not be honest! The scriptures I shared in this post spell it out plan as possible but for those who want more evidence go to my blog as I say above! Unlike right-wing conservatives who only use maybe 10, 20 – 25% of what Jesus said, I say read the Gospels for yourself! I am not affraid of what a good, honest, sound minded person will see! Conservatives add words to the Bible that are not there & leave out what is there! ANYONE WHO READS THE GOSPELS: MATTHEW MARK LUKE & JOHN, ANY ONE WHO IS HONEST, SEES THERE IS NO WAY THE LORD GOD JESUS COULD BE AFFILIATED WITH CONSERVATIVES, ALL HONEST PEOPLE CAN SEE FOR THEMSELVES IN THE BIBLE esp THE GOSPELS – JESUS THE CHRIST IS AN ANTI-CONSERVATIVE FAR LEFT LIBERAL WHO CONDEMNS CONSERVATIVES! Unlike corrupt lying conservatives I suggest reading the gospels for yourself, not just the 10-25% the right-wing tells you to read, I say read everything the LORD GOD JESUS said for I do not fear what each and every good, honest person having sound mind will discover! Remember JESUS said seek & you will find! BAD PEOPLE WON’T SEE, DISHONEST PEOPLE WONT SEE! READ JESUS FOR YOURSELVES, IF YOU HAVE A SOUND MIND, A GOOD HEART & IF YOU ARE HONEST YOU WILL SEE JESUS IS AN ANTI-CONSERVATIVE FAR LEFT LIBERAL! AMEN!!! April 5, 2015 in Christianity, Conservatives, Democrats. Republicans, Politics, Voting, The Economy, Welfare, Theft, Abuse,, Liberals, Politics, Religion, Republicans, Uncategorized, WeThePeople vrs CorporateGOP. ← Rich Corrupt Right-wing Parasites Want More And More Of Your Money: They Are Never Satisfied No Matter How Much Treasures Of Earth They Steel!! !